Crafted in sleek stainless steel with accents of 18ct rose gold, this two colour timepiece from Breitling's Chronomat 44 collection combines contemporary design with luxury Swiss components. Set with an onyx black chronograph dial complemented with rose gold tone detailing, the Chronomat 44 is powered by chronometer-certified automatic movement. 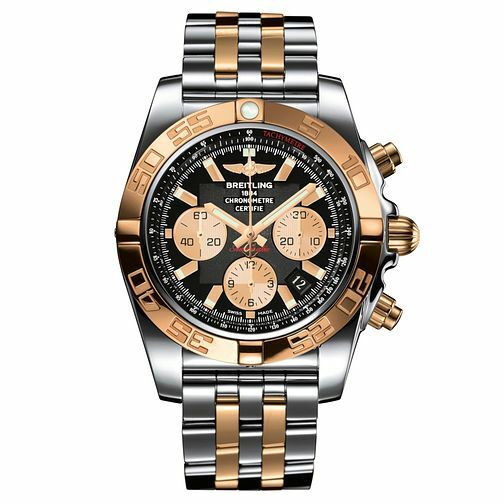 Breitling Chronomat 44 men's two-tone bracelet watch is rated 4.0 out of 5 by 1. Rated 4 out of 5 by Anonymous from Great watch I bought this watch in 2017 brand new and it’s a fantastic watch. Has great features and looks great on the wrist and gets lots of comments.